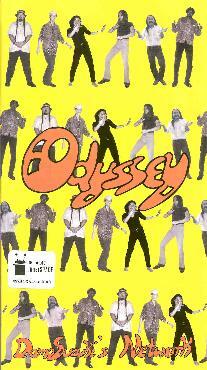 Damo Suzuki's Network - "Odyssey"
The 2-CD Odyssey is from live sets all recorded in the later part of 1999. Joining Damo on this outing is Tommy Grenas (Farflung, Pressurehed) on bass and synthesizer, Nicolle Meyer on drums, Carlos Robalo on percussion and voice, Alex Schönert on guitar and bass, and Dominik Von Senger on guitar. The music is similar to last year's Seattle, but I found the lineup of musicians on Odyssey to be stronger, particularly the combination and interplay between guitarists Schönert and Von Senger. Each guitarist wrings a variety of sounds from his instrument, and both are passionate players making them perfect choices for the intense vocals of Damo. And the band as a whole plays well together, the best tracks being those that lay down a solid groove against which they develop their jams. The first three tracks on disc 1, "Love Behind Mirror", "Amazing", and "Walking On Fire", stood out for the way they build pace and intensity, culminating in enjoyably cosmic freakouts in their final minutes. If these tracks were edited down to 5-minutes Damo might have some of the most molten burning tunes of the year. One of my favorites is "Winner Writes History", a solid rocker with a steady beat but with each musician seeming to operate in his own universe. It's complex and varied with blistering guitar work and a rock solid rhythm section. Disc 2 includes three tracks in the 20 minute range which took a few listens to really grab me. "Planet Of Heartbreaker" is a little different with the first 8 minutes or so featuring Damo's vocals alongside an electronic space journey. Then the band starts to kick in but retains the flowing dreamy atmosphere the electronics did making it a trippy space jam that again makes good use of the different sounds coming from the two guitarists. "Dance Of Thousand Tarantulas" and "Every Side Open" are both cool funky space groove tunes reminiscent of extended Can jams that must have been wonderful to hear live. The music has a trippy dancable quality, and there are lots of subtle instrumental bits that repeated listens will reveal. Overall, while my initial reaction was that some of the tracks on Odyssey didn't justify their length, after a few listens I've gotten into the groove and easily jam along with them unaware of the passing of time. The discs also come in the classy oversized booklet styled packaging that Seattle did. Contact the Damo Net Work at Schmiedetwiete 6; 23898 Labenz; Germany. Distributed by InnerSPACE Records. You can visit their web site.